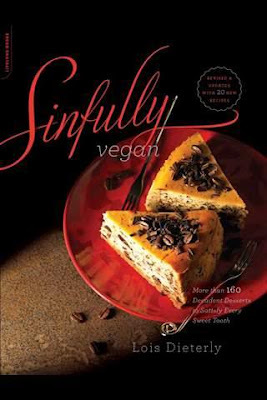 At a glance, the words “sinful” and “vegan” have no business showing up together in a sentence, never mind the title of a book. But Sinfully Vegan (Da Capo Longlife) puts a lie to all of that, filling a whole book with delicious and completely vegan desserts. Who would have thought that was even possible? Ironically named author Lois Dieterly says that she enthusiastically embraced a vegan lifestyle a decade and a half ago. She loved every aspect, but she really missed dessert and ultimately set about doing something about it. Sinfully Vega n is the book that resulted from those efforts. Even if you’re not interested in vegan cooking, but are concerned with a more healthful lifestyle, you’ll find a lot here to like. Dieterly includes nutritional information for each recipe. Thus you can see that her Banana Cannoli (yes, yes!) have 125 calories per serving as well as 5.4 grams of fat, 20.9 grams of carbs, 4.1 grams dietary fiber, 1.6 grams of protein, 0 mg cholesterol, 3 mg of sodium and 49 calories from fat. The nutritional information from each recipe is that complete. But look at the recipe itself. How could a cannoli ever be vegan? But with a “shell” made mainly with ripe bananas and a creamy chocolate filling mainly made from avocados, it could be argued that, not only is this dessert vegan, it’s also actually good for you. What a concept. A lot of the recipes are like that: something sweet and delicious that will enhance your health… and perhaps your waistline, as well.